ANCHORAGE, Alaska, September 13, 2010 (ENS) – Alaska Governor Sean Parnell has filed suit against U.S. Department of the Interior seeking to overturn the federal moratorium on offshore drilling in Alaska’s Outer Continental Shelf. The suit filed in federal district court in Alaska seeks to block the moratorium on the grounds that the Obama administration violated federal law and acted in an arbitrary and capricious manner. Alaska is arguing that the Department of the Interior violated federal law by failing to consult with state officials; by neglecting to properly consider the significant economic impact of a drilling moratorium; and by failing to issue a written decision explaining the basis for the moratorium. “Development of Alaska’s Outer Continental Shelf resources is of critical importance to Alaska’s future and the economic and security interests of the United States,” said Governor Parnell, a Republican. “We are taking this action to ensure that the federal government abides by applicable federal law, including its legal responsibility to make the OCS available for expeditious and orderly development,” the governor said. On May 27, a little more than a month after the explosion aboard BP’s Deepwater Horizon oil spill in the Gulf of Mexico set off the biggest oil spill in U.S. history, Interior Secretary Ken Salazar directed that “in light of the need for additional information about spill risks and spill response capabilities,” the department would postpone consideration of Shell’s proposal to drill up to five exploration wells in the Arctic this summer. He said the consideration of the proposal would be postponed until 2011. Secretary Salazar said that in the interim further information-gathering, evaluation of proposed drilling technology, and evaluation of oil spill response capabilities for Arctic waters would take place. In March, Secretary Salazar cancelled the remaining four lease sales in the 2007-2012 program that the previous administration had scheduled for the Chukchi and Beaufort Seas in the Arctic, and the President formally withdrew Alaska’s Bristol Bay from the oil and gas leasing program. Since then, Governor Parnell has advocated for the Bureau of Ocean Energy Management, Regulation and Enforcement to process permits to allow offshore drilling in Alaska waters. Over the past year, the state has been involved in litigation against environmental groups’ efforts to shut down OCS development off Alaska’s coasts. 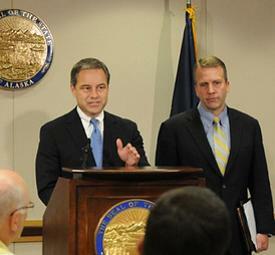 The focus of this litigation has been to ensure that Alaska’s OCS resources are responsibly developed. Recently, the state litigated a case in U.S. District Court in Alaska aimed at narrowing, and ultimately removing, the court’s injunction against exploration activities on oil and gas leases in the Chukchi Sea. The state was successful in its goal of significantly narrowing the court’s original injunction.